First, an anecdote: One morning, during the winter of 1987, as I sat in an English class at Texas Tech University (it was the ‘Works of John Milton’. Oh, man.) a very tall, very athletic, very late young man entered the room and sat, with a loud thud, in one of the chairs along the back row of the classroom. He propped his feet up onto a chair in front of him. Because he had both interrupted the lecture and the flow of the class, all eyes for a moment, were trained on him. Several of us recognized him as one of the stars of the university’s basketball team. Several of us recognized him because he and the team had just finished competing in the SWC tournament (How many of us remember the Southwest Conference?). Only a couple of nights before, the team had been on television losing a very close game to a much better, much more famous team. Many in the class-strangely, mostly boys-looked on this young man with tenderness. He returned their stares with an expression that could only indicate his familiarity with being gazed upon. “I gotta’ excuse for bein’ late,” he declared in a stentorian voice. He seemed sure that this would be sufficient effort for explanation. (I was wondering why, after almost eight weeks into the semester, he was bothering to show up at all.) I remember that he had no paper, no backpack, no textbook; his arms, long, jointed tools, were displayed on his desk as the only evidence of his intent to participate in the class. The professor, Thomas A. Langford, was a man to never miss an opening if presented with one. Dr. Langford was also an instructor who was not about to allow anyone to dictate the course or progression of his classroom. He never moved from his position at the podium during the entirety of the grand entrance, not once did he ahem or grunt or give any indication of discomfiture. “That’s fine,” he began. “Do you have an excuse for the game the other night?” The slap of the player’s shoes hitting the floor after being stung with such a zinger was the perfect, accompanying soundtrack. Waiting a moment to confirm that there was no excuse, Dr. Langford proceeded with his class and this student sat, silent and stunned for the entirety. When class was finished, the student hurried out of the room and when class resumed a day and a half later, he was not there. In fact, his memory was the only aspect of him that ever did return to class for the remainder of the semester. He had allowed us all only that one, brief glimpse of his beatificateness. I, for one, was glad for the episode because, I had, up that point, suspected that Dr. Langford was extraordinary and now I had both strong proof and witnesses. Regrettably, Thomas A. Langford passed away this past May 2, 2008. The Lubbock Avalanche Journal reported that he was 77 years old. When I found out about his death, a few months ago, I was just short of devastated. Dr. Langford had been, for me, one of those persons whose existence made my own a little more bearable. His presence in the room was a comforting one. His speech was straight and honest; his manner, affable and easy. I arrived at Lubbock, Texas in the winter of 1987. The land was frigid, icy and brittle; the whole environment was a withered, decaying gray. Academically, I was as dry as the air and had I not been enrolled, by chance, in an English class with Dr. Langford, I’m sure that my college career would have died on the vine. He not only assuaged my fears about my courses, with the requisite term papers and researched, essay exams, but also helped bring the material into focus. He assisted me with writing English papers, with understanding ‘Historical Geology’, with exposing ‘Business Algebra’ (still makes me shudder), with the correct format for writing medical journal entries. Further, Dr. Langford showed me the importance of a sense of humor during difficult times, how to shoulder responsibilities when others are depending on you, where to find courage when it seems lost. He was, in short, exactly the type of instructor you hope to have for your own classes and the sort of individual you pray your children discover during their own college years. There is no doubt but that my memory’s eye views Texas Tech so fondly because it sees Thomas Langford as the central figure in that exposure. I last had a correspondence with Dr. Langford a few years ago-or I thought it was only a few years. When I went to my e-mail account to read the date of our last exchange of notes, it was May of 2000. Time had, again, gotten away from me. I was always about to write him again. When I read about his passing, I had to content myself with the knowledge that at least I had reached out to him relatively recently. I had written to him a decade after graduating from Tech and that span of time seemed, somehow, appropriate. We had spoken of current jobs and projects. He had retired in 1996 (sort of-the University, recognizing a good thing when they have one, kept him on as Dean of the doctoral program) and had a friend publishing a book about the Biblical book of Exodus (Langford was a devout Christian and would undoubtedly list his charitable work with the Church above any academic accomplishments.) which he had had a small hand in writing. I was teaching school in Austin and while he was proud of the chosen field, he was a little bewildered by the subject-Latin. I told him that most people are confounded by the notion of it at first and he reiterated that he thought the whole thing was fantastic. 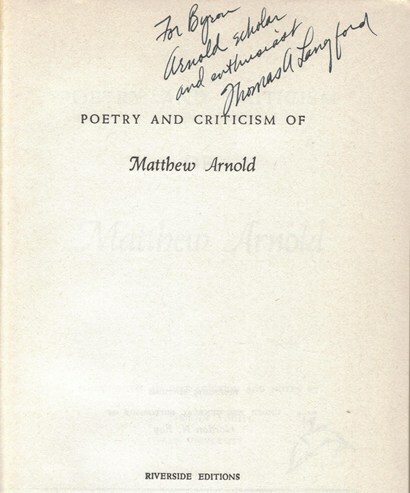 After I read his old e-mail, I went to the bookshelf and took down a book entitled, ‘Poetry and Criticism of Matthew Arnold’. It was one of initially two desk copies that Dr. Langford had had on his desk one day when I went in to talk with him. (I was always, whether I was taking a course with him or not, going in to have a talk.) As chance would have it, our class was studying Arnold that semester. When I mentioned that I was unfamiliar with Arnold, Dr. Langford handed one of the two copies to me saying that I should take it home, read it, get familiar. I was embarrassed about the gift. I thought that maybe I had said something that insinuated that I wanted him to give me one of the copies. I said I didn’t mean that. He said he understood and I should take it anyway. I tried to pass it off with a joke. I said that my mother would never allow me to have such a gift. She may, in fact, even think that I had stolen the book. Playing along with the joke he took the text away from me and wrote, on the inside cover: For Byron Arnold Scholar and Enthusiast Thomas A Langford. “There.” he said, handing the book back, “You shouldn’t have any trouble with your mother now.” I have the book here. It is, without question, one of my greatest treasures. ave atque vale, Dr. Langford.